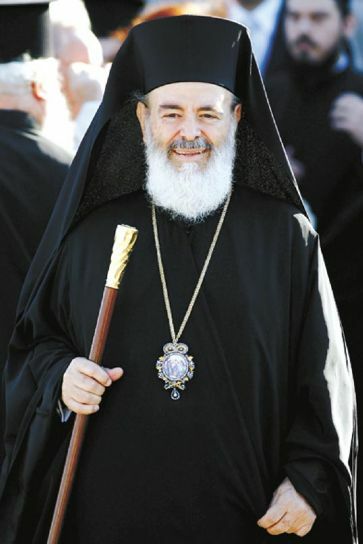 Shortly before his death on 28 January 2008, the late Archbishop Christodoulos of blessed memory wrote down his last words to his flock. They stir up much emotion, yet possess a Christian tone of joyful sorrow as he gives his flock his last exhortation and places all his hopes in the mercy of God. My brethren, do not forget me when you sing to the Lord, but remember my desire and love and beseech God, that the Lord would grant me to rest among the righteous. When these lines are read I will not be found in this life. My hope is that I will be found in the mercy of the Lord. I have no other surety except hope in the Lord. Nothing remains for me but the supplication that the Lord show leniency in His judgment and to forgive me. I loved my Savior with whatever strength was in my soul. He Who searches the hearts and insides knows. Many times Satan pushed me to actions and plans and to make decisions that I fear embittered my Lord, Who entrusted me with many talents. Perhaps I imitated the recipient of the five talents? Perhaps I worked towards His glory or maybe I did things for my glory and visibility? This I could not distinguish and I leave the world in fear that I did not accomplish to always tell the difference. I worked towards my purpose with all the strength I had and with the help of God I accomplished much. As many times as I was successful, I felt great satisfaction. Perhaps my labors had this purpose? And therefore what my Lord said will be fulfilled, that those who are satisfied with one of their good works, that these have already received their reward? The only thing that consoles me and illumines me is that the mercy and love of God is infinitely greater than all sins, and prayer is the way of salvation and true joy. Because of this I beg you with all the strength of my voice, my brethren and children, do not forget me in your prayers. Do a cross for me with your heart. Light a candle for my soul. In my life, I inevitably embittered many of my brethren, whether rightly or wrongly - of what importance is the distinction? Governance is against those responsible with its correct exercise, oftentimes as a terrible bite. My children, the stamp of governance has many thorns. I kneel before all those I judged - voluntarily or involuntarily - and I plead with them to forgive me from the bottom of their heart, that I may find mercy and rest for my soul before the Just Judge. From the depths of my soul I forgive all those who may have judged me. This is the life of mankind - hopes, dreams, aspirations and efforts, and so many other treatments for earthly life, which do not allow us to understand in depth that we are sojourners in this earthly life. As St. Gregory the Theologian said: "We are a fleeting dream, a phantasm that cannot be grasped, the flight of a bird passing over the sky, a ship which leaves no trace upon the sea." Before I shut my eyes, and as long as I have all my senses, to all I leave my blessing from the depths of my heart. And to those whom as the Metropolitan of Dimitriados I shepherded and taught for 24 whole years, and to my beloved sheepfold in Athens whom I shepherded for 10 years, and towards all the Greeks inside and outside the borders of Greece. I was your father my beloved children, led by faith that I was responsible for you. To you, therefore, I extend my final blessing. You know that I gave you all my love. My soul thirsted for your salvation. My deep faith that I pray to the Lord for you, was the only source from which I drew my strength. I wanted with whatever strength my poor soul had, to sweeten your pain, to boost your morale, to convince you that only if your heartbeat is in rhythm with God's holy will, only then will a smile of genuine joy never leave your lips, as much as can be found in this world. Do not seek happiness elsewhere, because then you will toil in vain, and you will not find it. Do not ever forget the words of the Lord: "Seek first the kingdom of God and His righteousness and all these things will be given you." Always illumine your thinking and the way of your life with the holy will of God. This will warm your hearts to always be filled with love towards God and towards your brethren and fellow-man, and it will give you the sweetest strength to feel the pain of others as if your own and their joys as if it were your joy. In this way you will find yourselves in the plan of salvation. Then your names will be written in the eternal books of heaven. In this way only will the fullness of joy, true joy, be able to exist in this world, and it will flood your hearts. The same Lord assured us, when His 70 disciples returned with great joy, saying: "Lord, even the demons are subdued in Your name." And He informed them with His comforting words: "Do not rejoice in this, that the demons are subdued, rather rejoice that your names are written in the Heavens." Who then is able to doubt this? And something more. To all He gave the authority to trample on snakes and scorpions and over all the power of the enemy, without any of them being able to impede one's way. You know how many people Satan finds and uses as his instruments in order to obstruct the path of salvation of those who want to be saved. He perverts their thoughts, makes their hearts poress and blinds their light, so that they are unable to see the good, and they use the most unfair, harsh and inhumane means to stand in the way of salvation. All these, as they are similar to snakes and scorpions, are crushed with the help of God. May God not allow any of you, my beloved children, to reach such a level. To all of you I pray that Divine Grace protects and covers you. My beloved children and my brethren, do not distance yourselves from the path of God. Love God and "prefer nothing but His love". Flood your hearts with Christ and Greece. My beloved children and my brethren, do not ever view Greece with indifference or sadness. The Lord is our Father and gave us Greece as our home. All of humanity are His children, and none is superior to another by virtue of his homeland. Let us learn to view as a gift of the Lord every country, together with their traditions and languages. Us Greeks have especially received an inheritance to be bearers and teachers of a great culture, honored throughout the world. Let us, therefore, live in a way that glorifies the sacred, honors the ancestors, keeps language as an expression of spirit and not simply as a means of communication. Let us have gratitude in our hearts toward those who gave us our country. Especially us, as followers of the Lord, let us always have in mind that the Christian is not sanctified by his environment but sanctifies it. My children, never do evil to your fellow-man. Scatter everywhere works of love. Whoever seeks need from you and you are able to sweeten their pain, do not deny them. Do not look to see if they are a kin or a stranger, known or unknown, of the same nation or a foreigner, of the same faith or a heterodox, of the same religion or a heathen, friend or enemy. Whoever has need, from your love they are your neighbor. Do not be absent from your religious duties. As often as you are infected with sin, whatever sin, small or great, immediately rush to be purified by the great mystery of Divine and Sacred Confession and be united with God through the receiving of Holy Communion. Always keep your soul ready, since at any time the Lord may call you to be found worthy of the heavenly Kingdom. I especially address at this moment you, my fellow workers, from the first to the last, from the oldest to the newest, from the greatest to the smallest. My beloved children, clergy and laity, I will no longer be near you. My love and prayers however will always remain with you. Do not forsake the holy work of enlightening the people, especially you my brother bishops, priests and deacons in Athens, in Volos and everywhere in Greece. When you go to our churches and preach the word of God, you will refresh my soul in heaven also. Do not deprive me of this refreshment. Remain faithful associates around my successor Archbishop, whoever it is, and give him your boundless respect, your love and your loyalty. He will love you as much as I loved you and will uphold with you our Church, in order to accomplish its sacred purpose. And now my beloved children and my friends: "Behold, I sleep in the midst of all silent and speechless. My mouth has ceased. My tongue is stopped and my lips are immovable. My hands are folded and my legs intertwined, my face is changed, my vision has erased. I do not understand the mourners, for my hearing does not receive the cries of the sad. My nose does not smell the fragrance of the incense. True love never dies, therefore I entreat all of my known and cherished friends, pray for me that on the day of Judgment, I may find mercy before that fearful judgment seat." DO NOT FORGET ME IN YOUR PRAYERS.